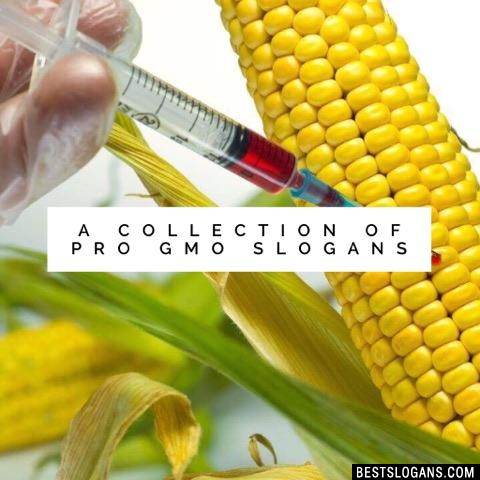 3 new entries added to pro gmo slogans, that include pictures. 1. GMO - Accelerating our Future. The same reason to be pro-science and pro-technology. We must stand with reason and rationality, just as we stand to use science and technology as tools for creating a better tomorrow. With millions of people dying because of natural contamination, drought, floods, Vitamin A deficiencies, etc., to be as foolish to call for a global GMO ban would be to do everything we've stood against. Where there's consensus of climate change, of evolution, of the Big Bang, etc., there's scientific consensus NOT political lobbying that transgenic seed production is safe. 1 GMO - Accelerating our Future. 2 We must stand for GMO, ending hunger is our goal! Can you think of a good Pro Gmo Slogans we're missing? Or come up with a clever one of your own. Please share below.